Things are not so simple when it comes to weapons. For safety’s sake, the steel of true weapons has been replaced with foam and fiberglass. This creates limitations that a seeker of realism must work around. It should be said that the first priority in weapons building is always safety. No advice here will lead you to make an unsafe weapon, unless you take things too far. Check your weapons thoroughly and often, keep weapon weights reasonable, make sure there’s enough padding, and remember eye safety requirements! 1. Toss out your neon pink round blades! Most basic advice first: make your sword look like a sword. Go for a weapon cover that is grey or silver if you can. If game rules limit your choice of weapon color, try and go for a more subdued shade. Round blades are a good approximation for clubs and sticks, not swords. Real swords have flat blades, and yours should too. There’s lots of building tutorials out there, and a flat blade isn’t any more difficult than a round blade. Maces are of course an exception to flat blades. No excuse for laziness though. Try and go beyond simple pool noodle if you’re making one. You can glue on foam to the head to create flanges and rings. Tape down the cover in between the ridges to emphasize the shapes you create. There’s a limit to just how accurate you can get. Safety requirements mean you’ll never have a stab tip that actually tapers to a point, or a blade with a cutting edge. Curved blades and durable axes can be difficult (but not impossible) to construct. You’re making a representation of a real weapon, not an exact copy. You’ll still have to use your imagination…but at least you won’t be swinging around a light saber on a medieval battlefield. Even if your character is grounded 100% in fantasy, research can give your weapons an air of authenticity. It can be useful to study Oakeshott’s Typology to get your mind thinking about how swords changed over time, and how one basic design (the European double edged sword) can have significant nuances. A fantastic resource is myarmoury.com. Their “Spotlight Series” of articles are almost required reading, while their reviews of reproduction weapons have listings for weight, center of balance, and other vitals. Wikipedia is also useful, but its coverage and accuracy varies from article to article. Some articles can be fantastically written and sourced, while most are a little short, but still of good quality. Just don’t cite it in academic work and blame foamsmithing.com when someone calls you on it. Two handed swords didn’t become common in Europe until the high middle ages. Before then, most melee combatants would carry a shield into battle. The term “Longsword” can be ambiguous. While there is consensus in a definition, people only familiar with D&D might be left out of the loop. Remember that a D&D Longsword=Arming Sword in most other communities. Spears were common throughout most of history and most cultures. Its hard to go wrong with a spear. Same with bows and axes. Madu’s come from India, they never really made it out of the subcontinent. Florentine was a fighting style that came out of fencing schools in Florence. While people probably picked up two blades and fought with them before the Renaissance, it can’t be considered common. Your Buster Sword is not realistic, sorry. Foam weapons are pretty chronically oversized. There’s a few reasons for this. People might want to reach 48″ for gameplay reasons, they may feel more powerful with a larger weapon, or they may think it gives them an advantage in battle. It doesn’t help that the boxy profile of a standard foam sword makes it seem even larger. Fight the urge to oversize your weapons! Research the weapon you want, find out how long it is. Get a core that’s 1-2″ shorter than the size you want. 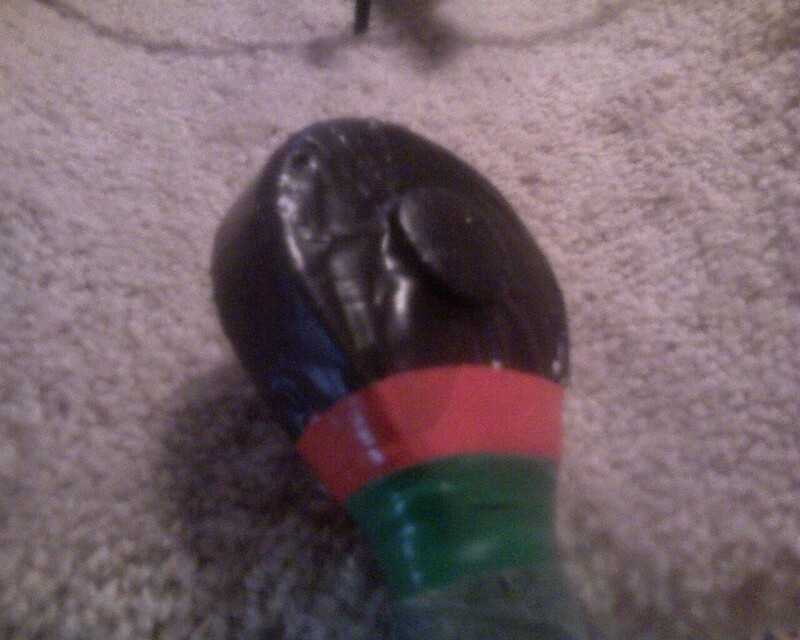 Pommel and blade tip will get it those last few inches. Try and keep the blade as narrow as safety and rules allow for. A wide blade looks cumbersome and crude. Does the blade have an interesting shape? It can be worth it to add a layer of foam to create a leaf shape or curve. Removing a layer could make for an unsafe level of padding in the narrow sections. The extra width from adding a layer is generally not noticed if it creates a visually appealing weapon. What about axes? Again research is key. The shape of axe heads varies wildly with culture and time period. Some historical axe heads are too small for a safe striking surface. It’s your responsibility to avoid such a danger. Stab tips can be a problem when foamsmithing. They must be large enough to be eye safe, but a large stab tip can seriously detract from a weapons attractiveness. When adding one to a sword, take pains that it doesn’t swell out from the blade. When making one for a spear, try to make it as compact as you can. A few inches across is all that’s needed for a safe weapon, don’t make it look like a paint can on the end of a pole. Featherweight swords simply don’t have a weight/length ratio that represents any sword made out of steel. Slightly heavier swords could possibly represent rapiers and small swords, but ask if that’s the type of weapon you want to be wielding. A 100% realistically weighted blade might hit harder than people in your group are ok with. Padding and counterweighting helps, but a heavy weapon will always hit harder than a light one. A historical Arming Sword of about 36″ might weigh around 2.5lbs. Personally, I’d build my version around 2lbs. If you’re an experienced fighter with a light weapon, you don’t lose much by moving up to a more realistic weapon. You’ll still be a good fighter, and your arm strength will grow to where you’re just as fast at your opponents with their light weapons. Challenge yourself. Unbalanced blades can be difficult to fight with. Without any counterweighting, a boffer sword’s weight is all in the blade. Historically, pommels were used to move the balance point of the blade closer to the hands. The balance point is what decides much of the handling traits of a weapon. A “well balanced blade” doesn’t mean the sword’s balance point is at the hands. It can be more maneuverable this way, but you’ll lose power on your swings. You don’t want to be taking heads off with your sword, but an authentically weighed sword will encourage you to fight in a (hopefully) more authentic manner. A historical arming sword could have a balance point anywhere from 2-6″ from the cross-guard. You can adjust the balance point by adding weights to the handle and pommel. Washers around the core are a common method, but they run a risk of breaking loose because the weight contacts the core in a smaller surface area. Wrapping lead fishing weight wire around the core is easy and durable. Make sure to thoroughly tape over the lead and wash your hands before eating a snack. Steel barstock also serves well as a counterweight, but cutting it can take some effort. Creating durable and attractive fixtures on a sword can take some practice. Its a worthy challenge though, because they do the most to make a blade look realistic. Eye safety rules means your guards and pommels have to be larger than most historical swords. That’s ok, your boffer hilts don’t have to match up exactly to the steel of real swords. Use the shape of foam fixtures to represent their steel counterparts. A (muddy) selection of weapons the author had in the garage. 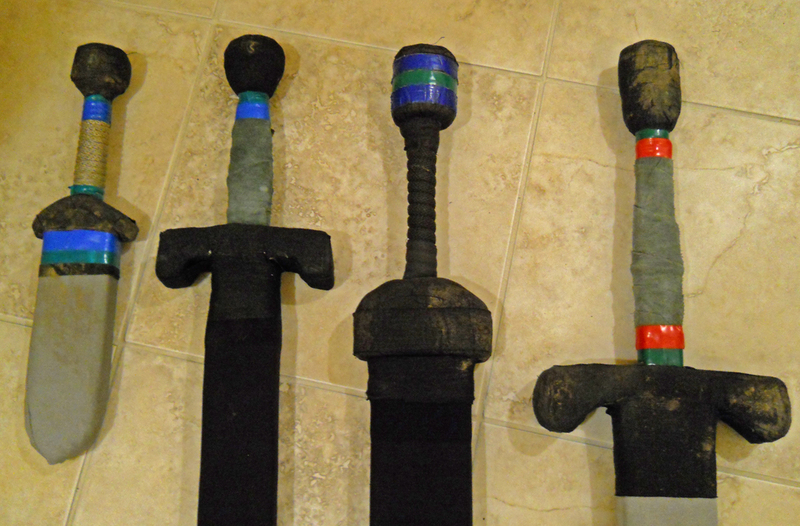 From left to right: Cinquedea Dagger, Arming Sword, Gladius (with anachronistic cylinder pommel), War Sword. The addition of a cross-guard should be the first skill you learn. They’re present in virtually every historical sword because they keep the hand from sliding up onto the blade. Because guards are so universal on real swords, a sword that lacks one absolutely screams “I’m a boffer!” You’ve got lots of choices for guards, but they’re often associated with one culture or place. The Tsuba of Japanese swords is one of the simplest to recreate in foam, but would look out of place on a European Knight. If you do nothing else from this guide, please add a guard. 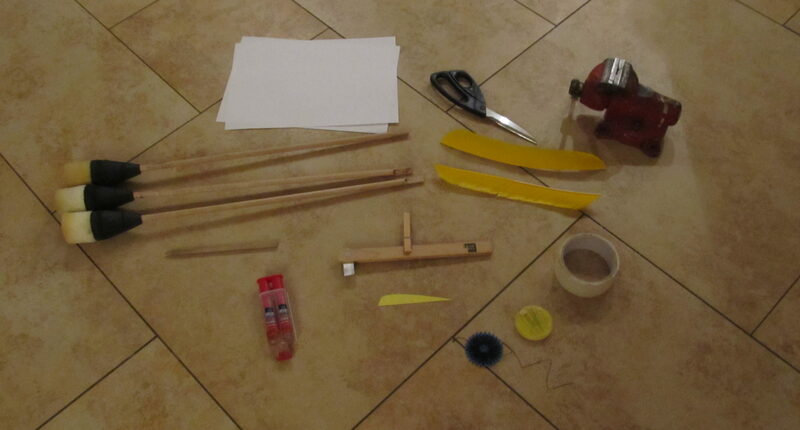 It takes very little effort when building a weapon, and will improve its realism greatly. The pommel is the next most visible way to improve a weapon. Most boffer swords have a pommel that consists of a strip of blue foam wrapped around the core a few times. This results in a rough cylinder that isn’t present on many historical swords. Go for variety and do different shapes. Flat pommels are fairly easy, construct them as you would a very short blade. Beveling down a cylinder pommel can result in a bottle stopper shape that’s quite attractive. 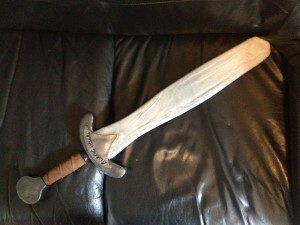 This can be seen on the Arming Sword and War Sword to the right. Adding a Ricasso to a sword can provide interesting handling opportunities, as well as more variation in design. You can either shave off some foam to make it narrower, or compress it tightly under a wrap of tape. Don’t make the ricasso too large, or it could interfere with the striking surface. Ricassos were generally a later European feature. A good grip will look fantastic and improve the handling of your weapon. Look to historical examples for what type of grip to make. Our ancestors figured out the best ways to hold a sword and our modern hands aren’t any different. The standard boffer sword has a cylindrical handle, but few were like shaped that historically. An oblong handle encourages the hand to grip the weapon correctly. Many european blades incorporated a bulge in the handle. Rope and leather are both good texturing materials. So there you have it. Some basic instruction for making a more realistic weapon. Pick and choose from my suggestions, or go all out and follow each one! Make sure you send in your completed weapons and any lessons you may have learned to contact@foamsmithing.com. wow, this is gonna help a lot, thanks for posting, i liked the dagger that was on the couch closer to the beginning of the article, and might try to replicate the blade shape on my own sword.